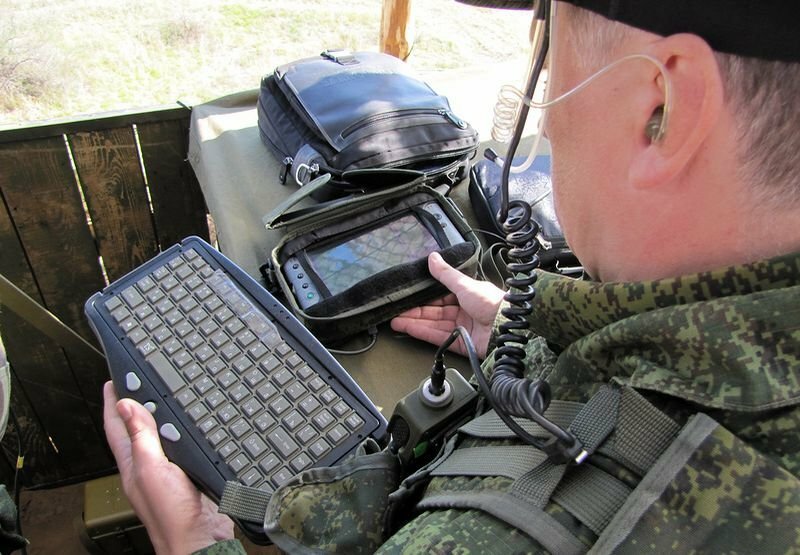 Complex of reconnaissance and communication "Sagittarius"
Recently, in the 5th infantry brigade near Moscow they have begun to develop a complex of reconnaissance, control and communications (CRCC) "Sagittarius." The complex is produced by a domestic enterprise "Radioavionika." The tested individual set is a kind of a mobile type computer. It connects virtually any device. • When creating a network of individual complexes, the commander’s computer will display all the necessary information about the people under his command, as well as the information about the enemy coming from them. An ordinary soldier needs only to press a couple of buttons and the coordinates of his location or the enemy’s location will appear on the commander’s display. • The subunit commander can easily combine the received data with electronic maps or with a picture of the given area received from the satellite. The first to receive such complexes and master them will be military intelligence. As reported by the designers, the complex "Sagittarius" is actually a mobile personal CICS. - the production of data for effective use of personal weapons and means for close combat. • The complex "Sagittarius" is linked to all the Soviet and Russian means of reconnaissance. 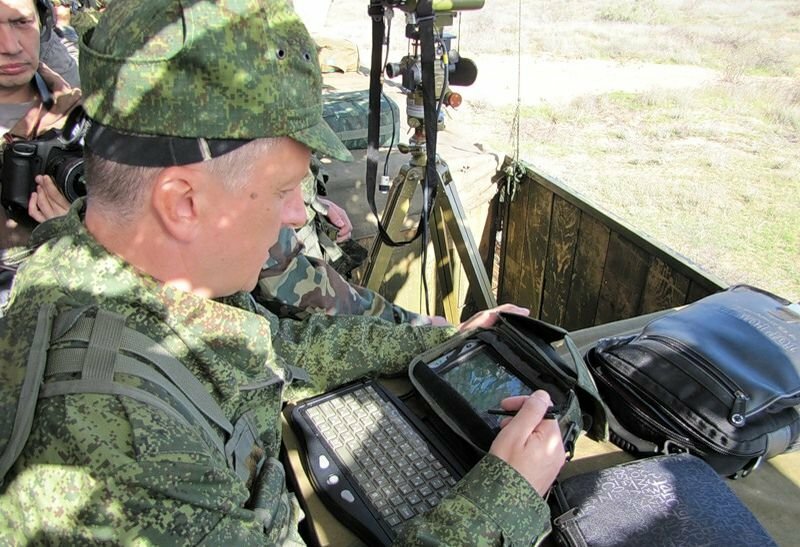 Besides the complex interacts with protractors, radars, instruments of target assignment, targeting and UAV БПЛА. • The complex was taken into service in 2007 and is supplied as standard. It is given primarily to the ground reconnaissance units. The first samples of the complex after being tested in combats and on different sites enter on completion. Our scouts, having experience of operating foreign counterparts «FELIN», «IdZ-ES» and «Normans» asked the developers to improve the existing model of the complex "Sagittarius." • The matter is that of the first samples was developed on the base of the elements of the 2000s. The designers were sympathetic to the request of the military and a modernized CRCC "Sagittarius" enters testing. After successful testing ground units became massively provided with the complex. The armed forces of the Russian Federation have already got more than one thousand units of the complex "Sagittarius." • General Designer of the Enterprise "Radioavionika" A.Kaplin, talking about the complex "Sagittarius", noted that the first samples of CRCC were somewhat uncomfortable for soldiers - had a pretty decent weight of 5.4 kg, interfered with the soldiers’ passage of the assault strip, prevented their access to pouches and first aid kits. • Now, after modernization the complex weighs 2.4 kg, became of a smaller size, and large blocks are fastened so as not to interfere with other tasks. At the moment there are no substantive comments on the use of complex "Sagittarius" from military ground units which mostly use the complexes. • CRCC "Sagittarius" can have several levels of configuration. The easiest option of configuration is intended for military units up to the commander of the department. The next level is for the commander of the platoon. It has a powerful computer system with a remote control of a multifunctional type. The third, the most complete level of integration, is for the unit commander - the battalion and brigade commanders. • The range of interaction of the complex in the department - about 1.5 miles, but any of the individual systems "Sagittarius" works as a relay station, which significantly increases the range of action and information control of a given area. In addition to voice messages standard built-in commands can be sent by radio communication. The recipient can view or listen to them after receiving. • This innovation was introduced specifically for the scouts not to be distracted from the job or not to lose visual inspection. CRCC "Sagittarius" has an autonomous navigation module in it, which is provided with an inertial system. It gives a soldier an opportunity to know exactly his position, even if he came out of zone of the satellite navigation system. Switching between navigation systems is carried out in the complex automatically. • The system can be equipped with helmet-mounted display subsystem for fire out of the hiding place. For example, in the interaction with the thermal imager "Shahin" information from it goes to the military display, which allows keeping accurate and aimed fire without leaving the hiding place. • The complex has a subsystem of the "us and them" identification type. Its range depends on the characteristics of the mating sighting systems. The subsystem sends a request to an unidentified object, and if the object is recognized as “native”, the soldier will hear in the earpiece sound notification. If after sending the request, the subsystem is "silent", the object is determined by a complex "Sagittarius" as "alien".